Over the past twenty years the fabric of the Cottage has been allowed to deteriorate and so the Trust’s primary concern during our first year has been to safeguard the structure of the building while we move towards a full and complete restoration. Three structural surveys of the building have been carried out – one with a firm of surveyors who have an expertise in historic buildings, the second with an experienced thatcher, and the third with a structural engineer. 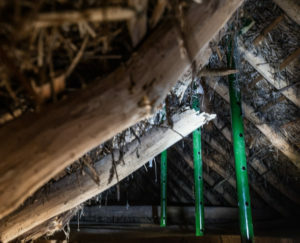 Thatch needs to be replaced every generation and when the old straw is removed, it will enable us to fully inspect, mend or replace any failed wooden beams that support the roof of thatch. One of the curiosities of the Cottage is that the roof beams were not made of sawn timber, instead they are simply young saplings that had their bark removed, and so this soft wood is inherently more vulnerable to insect attack and fungal decay. Yet in the best practice of modern conservation, we are endeavouring to retain as much of the historic fabric of the Cottage as possible. So acting on the detailed instructions of the structural engineer, twenty supports have been put in at points identified by the survey and we believe the structure of the building is now secure for the foreseeable future. The thatch is deep and weatherproof and we will continue to monitor the situation as we move towards the beginning of the renovations. If further short-term problems arise or measures are needed then we will address these as or when it is necessary. The Cottage is subject to three weekly visits, is regularly inspected & cleaned and the garden is being cared for and maintained. The garage is also being used by a local resident that offers additional presence and security. We have been in touch with Historic England (formerly English Heritage) and while the significance of the Cottage is appreciated, the building is not on Historic England’s At Risk Register. The principal conservation officer and the historic buildings adviser from Arun District Council have both made a preliminary visit to the Cottage and we will be following their guidance & advice during the renovation. The Blake Cottage Trust is conscious of the condition of Blake’s cottage and is doing everything in its power to secure its future. To cite one of Blake’s favourite sayings from the Bible: Lay up treasures in heaven, where neither moth nor rust doth corrupt … for where your treasure is, there will your heart be also. Previous Previous post: How do you choose an Architect?